life-changing experiences + being alone. It can be difficult to determine whether or not something is truly a life-changing experience or not. We don’t always want to label something as “life-changing” because chances are, more important things will happen to us one day, and we don’t want that powerful label to lose its meaning. That said, after much consideration, I am officially declaring yesterday a life-changing experience for me. I have been a diehard fan of Fall Out Boy since my older sister put Sugar We’re Going Down and Sophomore Slump or Comeback of the Year on one of her mix CDs in 2004 and left it in the boombox in our bathroom. (Side note #2: When was the last time you heard the word “boombox”?) I caught up on FOB’s first two albums (From Under the Cork Tree becoming one of my favorite albums ever), fell in love with their next two, and survived the 2010-2013 hiatus (though seriously struggled when My Chemical Romance broke up during it — my little emo heart couldn’t deal). I reveled in the glory of their comeback during my senior year of high school and I am thrilled to report that they’re still excellent, unlike many bands that get back together and suddenly don’t know how to make good music anymore. With my husband Pete Wentz in the Fall Out Boy Pop-Up Shop at Rock ‘N’ Roll Rescue Camden, 11 October 2015. 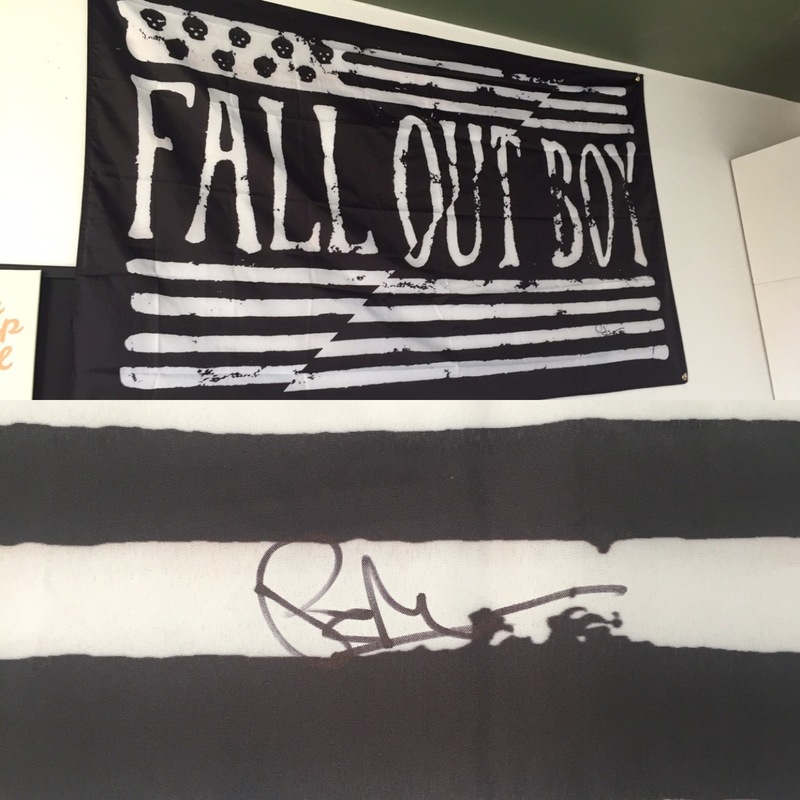 The newest (and biggest) addition to my wall, signed by Pete. There’s something ironic about meeting someone known for singing and screaming on stage just to find out that they’re really quiet off stage. It is equally ironic that I, the girl who never shuts up, was completely silenced just from being in Pete’s presence. I don’t think either of us said more than two words to each other, and after he signed my new most prized possession and took a selfie with me, I was escorted out, borderline paralyzed in awe and slightly confused by what had just happened to me. At least I didn’t cry? Alright, Gabi, we get it. You met Pete. What does this have to do with being alone? Well, disembodied voice, if you must know, after the signing, I attended Fall Out Boy’s show at the SSE Arena in Wembley by myself. I had never been to a show alone before last night, and I think I can safely call it my new favorite thing. I have been to many concerts in my life, and Fall Out Boy has been a large chunk of them. This was my fourth FOB experience, and by far, my best FOB experience. I was anxious about going to a show alone. I usually like having someone to stick with because the idea of getting sucked into a mosh pit with no one to pull me out is terrifying, but I realized after seeing Brand New perform at Alexandra Palace that getting separated from your friends at a show is almost inevitable. With that in mind, I embarked on my journey to Wembley alone, prepared to take on the wild crowd on my own. Halfway through FOB’s first song (after staying relatively calm during their three opening acts), I realized that I shouldn’t be fighting the crowd, I should be embracing it. I’m not really the kind of person to have my back against the wall all night at a show, but I have never been a crazy “dance like no one’s watching” person. That changed last night. Clearly, the only logical explanation is that my friends are bad people. I’m always with them and have kept my dancing fairly reserved out of fear of being judged by them, but being on my own last night, I have never felt more uninhibited. Possibly apart from the group of people I met at the show who knew nothing about me and couldn’t justifiably judge me, no one was watching me, so I danced like it. I jumped, I screamed, I sweat, and I almost passed out from dehydration. My feet are still screaming almost 24 hours later and the fact that I have a voice right now has got to be some kind of scientific breakthrough. Having fun has nothing to do with the people around you, but everything to do with yourself. I always thought that I had less anxiety going to a show with friends than I would on my own, but going to this show alone proved me wrong. “Care-free” is the last adjective I would use to describe myself, but last night, that is what I was. P.S. If you’re interested in listening to some Fall Out Boy, you can check out my Spotify playlist, “Fall Out Boy: Gabi’s Top Ten.” If you don’t have Spotify, I can only recommend that you look these songs up on your own. Please note that this is my personal top ten and I will fight with you about this for hours if you try to tell me I’m wrong. Someone please take that as a challenge. < the things you never think about. 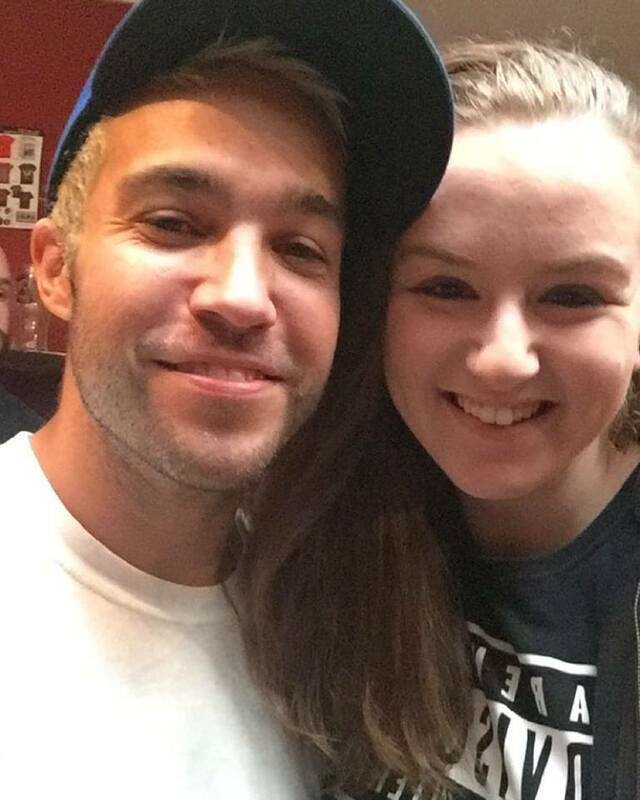 It is so great that you got to meet Pete Wentz! I am not a huge Fall Out Boy fan like yourself, but I like a few of their songs. I knew exactly what you meant about not wanting to be disappointed in meeting someone that you have idolized for so long. My experience with meeting Simple Plan several years ago gave me the same feelings, but I am happy to say that they were really great, just as you report that Pete Wentz was. I am also relieved that you are safe after attending a concert by yourself, especially in a new city such as London. I don’t think I could do that alone. It really shows how confident you are and I’m glad you had a good time! Gabi, I really respect your courage for going to a concert alone! I always considered it but am too chicken to actually try it out. Also I’m so jealous you got to meet your favorite celebrity, I don’t even know if I could manage two words out like you did. Do you think you’ll be going to more concerts alone while your in London? And if so, which ones?